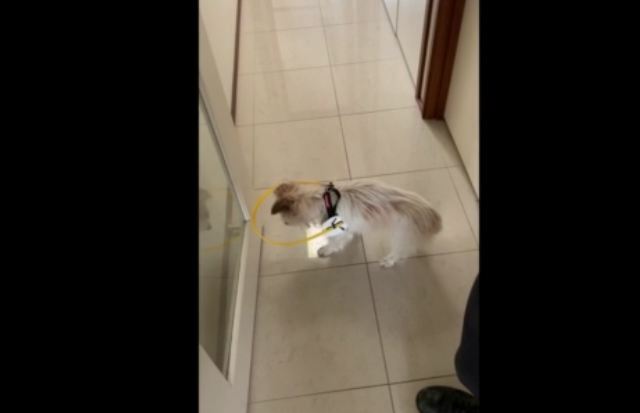 Blind dog Jesse, 18, is always bumping into things in her house so her owner, Simon Throp built a protective hoop to stop her from hitting her head so much. The clips filmed in Canberra, Australia show the daily routine of Jesse, trying to not bump her head, finding her way around her kitchen, and sleeping. “Our 18-year-old dog Jesse is blind and kept bumping into everything, we made her this contraption so she would stop hitting her head!” Simon told Newsflare.